Facebook is now releasing Timeline update for all Facebook Pages for business, organizations and brands. Facebook Page owners can now upgrade their Facebook pages to brand new Timeline view design. Few days ago Facebook released new design for groups, now they are bringing Timeline view to Pages too. Previously Timeline was only available to profiles. Facebook is pushing this refreshing new design update to all pages from today, all Page admins will get a notification about this. Admins can see the updated Timeline view and publish it to the public from today. Facebook is giving 30 days time period to customize the page and publish it. After 30th March all Facebook Pages will be automatically updated to new design. This new Timeline update for Facebook pages brings some new features. The most useful feature is the ability to send direct messages to Facebook page owners. From now when someone visit any Facebook pages he will get an option to send messages to the page owners. The communication between Facebook fans and Page owners has become more easy. New Facebook Timeline view allows to highlight any post by pinning at the top of the page and add important events in the timeline view. Companies and Organizations can make their Facebook Pages more attractive to visitors by adding unique cover photos. This allows to add more personal touch to Facebook pages. New Facebook Page design will give more personalized experience to fans. It will show the names of friends who like the page, friends activity feed about the page and much more. So, overall the new timeline view for Page will make Facebook Page more attractive to both fans and admins. One bad thing about new Facebook pages layout is that from now it will not be possible to select custom landing pages. To learn more about new features of Timeline view for Pages visit this link. 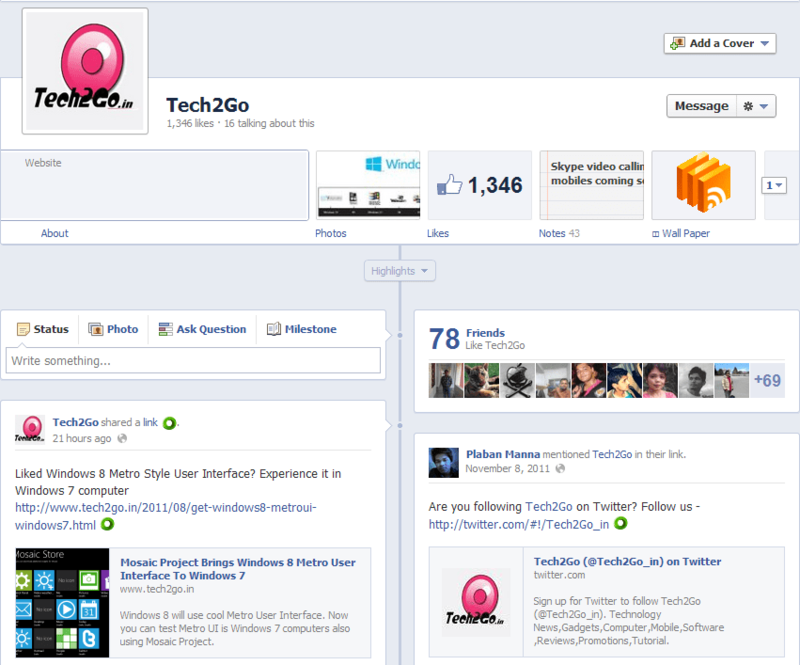 Very soon Tech2Go Facebook page will be updated to new Timeline design…stay tuned! How To Create Facebook Profile Picture Hack? Loved the article? Why not share it? How To Keep Your Gaming Accessories Cool While an Intense Gameplay? Is Social Listening Important For Your Campaigns? How to open APK files on computer? How to add web push notification to website? How to easily root an Android device? Reliance JioFi Review: Can it replace home internet? What if the avengers had real jobs? How to create a stunning website using Artificial Intelligence?